Nine times out of ten, I hate Christmas music. Outside of “Blue Christmas” and “The Fairytale of New York,” by the Pogues, which makes me homesick for the dive bars in Chicago filled with Irish folks chatting over shots of Jameson and cold bottles of Miller, I am most definitely not a fan of the genre. I want to stab my ears out when I hear “All I want for Christmas is You” and every year, they pull Mariah Carey out of her crypt and she gets up there and smiles knowing how much cash she’s about to make for the month. 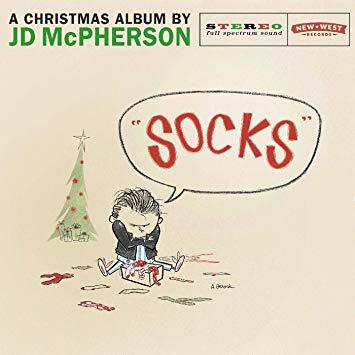 On JD Mcpherson’s new Christmas record, Socks, I don’t feel that mind-numbing hatred, but in fact, I absolutely love it. Instead of hokey tunes that feel like you’re trapped in mall-flavored hell, Socks is a refreshing take on a stale genre. I get it, tons of bands, artists, and labels love to cash in at Christmas because fans eat the genre up, but Socks doesn’t come off that way. Instead, it feels like one of McPherson’s records, just done up in red and green lights and tinsel. What’s cool about Socks is that it’s very much in the spirit of McPherson’s first record, Signs and Signifiers, where the songs feel like they’re straight out of the Little Richard songbook. Nothing on Socks feels like it was written as a throwaway, but instead, he could play them in the middle of June with the same sense of excitement. These are straight up old school-minded rockabilly tunes that well-written and boy do they swing. The vibe is playful and there’s a swing of the hammer that just doesn’t quit. “All The Gifts I Need,”, “Hey Skinny Santa,”, “Socks,” and “Santa’s Got a Mean Machine,”, all of these songs are total sock hop dancers that you can’t do anything but bounce around to. Socks is the perfect Christmas party record, its loud, fun, and never gets lame. Basically, let me put it this way: if you can’t put Socks on the turntable or wireless speaker while cooking dinner and not want to do the twist in your socks, you’re a monster. Get out and buy a copy before everyone else finds out about the record, you jolly Santa-themed maverick, you. Socks is available on the New West Records store, Amazon, iTunes, Spotify, etc.